A cyclist rides a fat tire bike on Red Sandstone Road last winter. 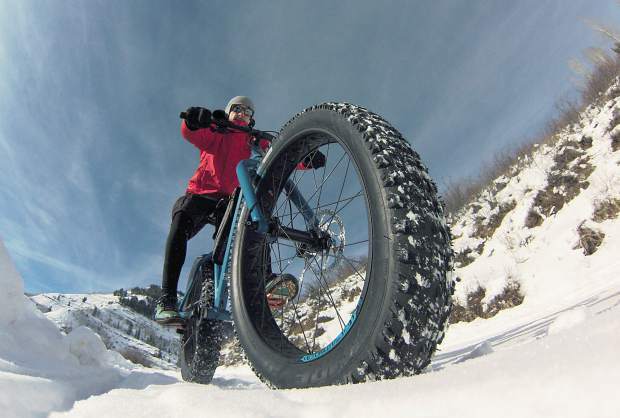 Currently, Red Sandstone Road is one of only a few U.S. Forest Service areas in Eagle County where fat bikes are permitted, but the local ranger district is working with area mountain bike groups to expand opportunities for fat bike riders. GLENWOOD SPRINGS — The White River National Forest’s winter motor vehicle use season began Wednesday and ends May 20. During the winter season, all wheeled vehicles (including bikes) are limited to plowed routes or routes opened through special order. Winter motor vehicle use maps identify routes and areas designated for “over the snow” motor vehicle travel. The maps are free and available at all ranger districts. The Vail Pass area switched to winter use and “over the snow” vehicles Nov. 15. The Vail Pass Winter Recreation Area, which traditionally opens the day after Thanksgiving, will postpone charging fees until at least Dec. 1 or until sufficient snow has fallen to begin grooming operations. Fat-tire mountain biking is allowed on roads open to wheeled vehicles that are plowed. Currently, all trails are closed to fat-tire bikes in the winter in accordance with the White River National Forest 2011 Travel Management Plan. The forest currently is working with the local International Mountain Biking Association representatives who will lead a public process and develop a potential proposal for “winter” routes that would be open to fat-tire snow biking. Until then, forest users are asked to obtain and adhere to the winter motor vehicle use maps and special orders to provide for visitor safety and protect underlying vegetation and wildlife habitat. For more information contact your local Ranger District. You also can find information by visiting http://www.fs.usda.gov/whiteriver and clicking on “Ranger Districts” in the upper right-hand corner menu.